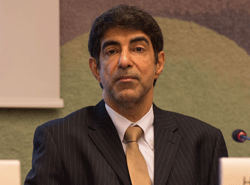 GENEVA, Sep 12 2018 - Enhanced South-South cooperation is key to addressing instability and armed conflict as well as to bringing peace and stability to the Global South, says the Chairman of the Geneva Centre for Human Rights Advancement and Global Dialogue Dr. Hanif Hassan Ali Al Qassim on the occasion of the 2018 International Day for South-South Cooperation. “Enhanced South-South cooperation in the political, economic, social, cultural, environmental and technical spheres as well as adopting joint positions on human rights policies in international fora will undoubtedly strengthen the capacity of developing countries to meet the goals and targets of the 2030 Agenda for Sustainable Development of the United Nations,” said Dr. Al Qassim. The Geneva Centre’s Chairman observed that enhanced South-South cooperation was required to turn conflict into cooperation and to address global issues requiring a coordinated response from countries in the Global South. “Economic cooperation and trade between countries in the Global South serve as instruments to foster greater economic integration and the realization of common aspirations. This cooperation should be made to extend to the area of multilateral human rights issues to ascertain that universal values prevail over politicization in particular in UN fora. Ideological and political differences in this context should not dim the voice of the Global South in their joint pursuit of peace and stability,” Dr. Al Qassim stressed. In this connection, the Geneva Centre’s Chairman appealed to decision-makers in the Global South to settle political disputes and to promote peaceful relations. He remarked that major armed conflicts occur primarily in the Global South and hinder the achievement of durable peace and development. More than 90% of active conflicts worldwide take place between and within developing countries. At the same time, economic growth and the predominance of human rights in developing societies will in turn consolidate peace and security. In this connection, Dr. Al Qassim praised the landmark peace declaration signed on 9 July 2018 by the leaders of Eritrea and Ethiopia to end one of Africa’s most prolonged conflict. “Peace and stability are preconditions for economic growth, development, trade and for human rights to prevail. Armed conflict and military confrontation hinder trade and economic growth and jeopardize the rule of law. Greater efforts should therefore be undertaken by decision-makers in promoting peaceful relations between developed countries. “I therefore hail the recent decision of the leaders of Eritrea and Ethiopia to set aside political differences and to work jointly towards peace, stability and prosperity for their peoples. I also salute the efforts of His Highness Sheikh Mohammed Bin Zayed Al Nahyan, Crown Prince of Abu Dhabi and Deputy Supreme Commander of the UAE’s Armed Forces, in restoring the relationship between both countries after two decades of conflict. I voice the hope this human right will thereby be enhanced in the whole region,” Dr. Al Qassim underlined.